Amalia Bazán is 76 years old and her phone rings at any time, any day of the week. 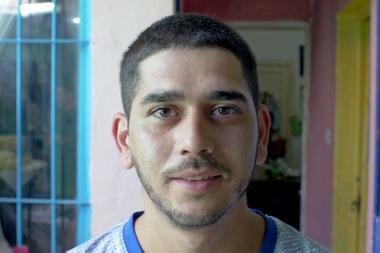 “We are always working: where there is need, we are present,” he says in the dining room he founded 20 years ago, a few blocks from the Hidalgo and La Cárcova towns, in José León Suárez, San Martín district. Account that began giving him to eat to about 150 boys and today there are 1600 people of different ages enrolled – each one has his card- that they remove from Monday to Friday the meats at the time of the lunch and the snack. “They are about 5000 rations every day, because families are very numerous,” explains Amalia. 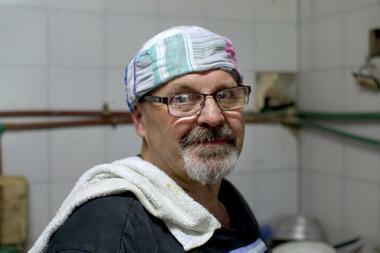 In the southern area of ​​the city of Buenos Aires, the Gargantitas dining room has no truce either. Its doors are open Monday through Monday and the queues are getting longer. Located in the villa Zavaleta, it assures the dinner to 70 families, about 900 people. Two years ago there were 300. In a socio-economic context shaken by inflation, the increase in the indices of poverty, indigence and unemployment, from the suburbs to the city, the referents of the community kitchens assure that the crisis is felt and much. Not only did the demand increase, but the range of its beneficiaries was expanded: before they were just kids, now there are entire families, even many who had never had to resort to a dining room. “I always tell the kids that they do not have to be ashamed to be poor, what is bad is not to grow inside,” says Amalia, founder of the Corazones Abiertos dining room. Although a considerable number of these organizations began serving food right there, today they keep that place for people in street situations or the elderly. The explosion of need surpassed the physical space and made them begin to deliver the portions in tuppers, pots and makeshift containers that people approach the place, queuing up to be served. Consulted about which are the programs that are being implemented in the Buenos Aires territory to respond to this reality, from the Ministry of Social Development answer that, on the one hand, more than 1,700,000 students have breakfast or snack and lunch in schools of the province. In addition, 300,000 families are part of the Más Vida food program, while 434,000 children and pregnant women in 60 municipalities receive milk thanks to the “One glass of milk per day” initiative. On the other hand, they emphasize that in 2018 the Program for Strengthening the Community Space Network was created to assist with a card to different organizations with a monthly amount of 5,000 pesos to buy food, equipment and pay for services, reaching 50,000 families. Mirta Ortega (45), founder and heart of Gargantitas, maintains that the situation is even more critical than last October, when LA NACION visited that dining room for the first time. “There are people who have lost their jobs or who do not have any chores anymore, some of them are in line very early, because they are afraid of running out of food,” Mirta says. From the Ministry of Human Development and Habitat of the GCBA, they point out that they have the Porteña Citizenship program, so that vulnerable families can make their purchases in supermarkets. They claim that it increased from October to December 2018 by more than 30%. According to figures from the last Barometer of the Social Debt of Children of the UCA, food insecurity – the difficulty of accessing food in quantity and quality due to economic problems – is not a new phenomenon, but it worsened “significantly in the last inter-annual period 2017-2018 “. In that period, the proportion of children and adolescents living in homes crossed by this harsh reality, climbed from 21.7% to 29.3%, while the number of those who went hungry (severe food insecurity) it grew from 9.6% to 13%. With respect to boys and girls receiving food assistance in school canteens or other organizations, as well as those whose families are beneficiaries of food boxes or pockets, the jump was from 36.1% to 36.6%. Amalia is a psychologist and has an energetic voice. It is a tractor. Last December, her husband and unconditional companion in the dining room, Oscar, had an ACV. It was a hard blow, which is still recovering. But even that did not stop her. In the kitchen of his dining room there is a clear slogan: the pots have to shine. “I always tell the children that they do not have to be ashamed to be poor, what is bad is not having dignity and not growing inside: here we are trying to show them that there is another possible path to the street, drugs and crime” , he emphasizes. His dream is that there are no more dining rooms and that his is transformed into a 100% training space, with workshops that provide job opportunities. On the top floor they are building classrooms to make the project grow. “We handle between 12 and 13 tons of food per month, but here we give much more than a plate of food, there are workshops such as theater, singing, school support and we have agreements with neighborhood clubs for boys to play sports,” he says. “Effects of the economic situation on children, children and adolescents in Argentina”, recently published by Unicef, shows how in the last year in the families of vulnerable sectors the restrictions on the consumption of food increased both in their quantity and in its quality: its diet is composed almost exclusively of flours and sugars. It is also pointed out that in many households meals are skipped or adults do not eat to leave the food to the children. From the Ministry of Social Development of La Nación, admit that “it is clear that the situation was very complex and that affects especially the most vulnerable sectors.” In this line, they affirm that “food assistance is being updated through different programs, seeking to accompany the impact generated by the effects of the economy”. They say that the first thing he did was to “strengthen the relationship” with all the social organizations that work in the territory, from the canteens to Cáritas, “in order to be able to give the answers according to these needs”. The soul of the eaters are the collaborators: everyone works in exchange for a plate of food. In addition, they are available for any task that needs to be done. That is the case of Gastón Romero (44), who was dismissed last October from the warehouse where he worked and now withdraws food for his wife, three children and three grandchildren in Amalia's Open Hearts. Banco de Alimentos, an NGO that seeks to be a bridge between those who suffer from hunger and those who wish to collaborate. Last year, 5,537,813 kilos of food and products were delivered from the bank, reaching 143,342 people per day. 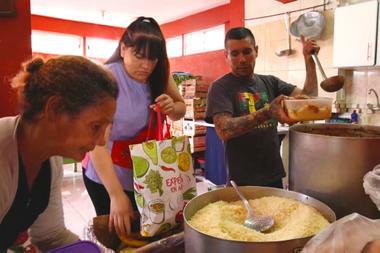 Gargantitas also receive 300 food rations a day from the Buenos Aires Ministry of Social Development, with the collaboration of the Nueva Pompeya civil association and private donations. “But it's not enough, we always need more, we prepare about 210 liters of food per day,” says Mirta. Stews, polenta, legumes, noodles and rice abound in the menu. Once a week there is chicken or meat, a luxury that almost can not be given. “Here there are no milanesas or baked chicken, because it is not enough for everyone, we mix the meat with stew, with many vegetables, or make stew to make it, ours are always popular pots”, summarizes Mirta. When there are more people than food, they are searched as they can. 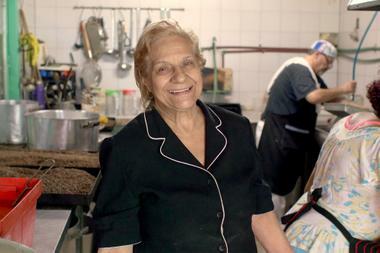 “We open the doors to everyone: grandparents, kids on the street, kids and adults, moms who come every day to ask for milk and bread, there's a lot of need, people come early to drink the mate,” says Mirta, whose day starts sometimes at four in the morning, cleaning and starting to prepare food. The Amalia Dining Room is supplied with donations from different foundations and individuals. “In addition, the government of the province gives us 180 UDI (Child Development Units) scholarships, but we also generate: we make and sell wedding dresses and purses”, explains Amalia. The needs in the dining rooms are many. “Everything goes well with food: beans, noodles, rice, lentils”, says Mirta, who opened the dining room in what was her own house (today she lives at the top). Amalia invites everyone who wants to come closer: “You can come when you want and see how to collaborate from the heart. 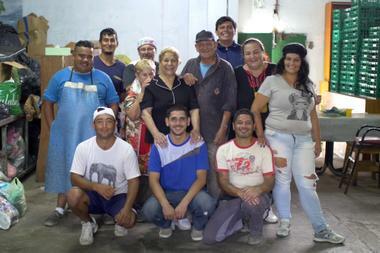 Manos en Acción, an organization that works in Pilar. They offer breakfast and dinner to 350 children and adolescents, in their “Houses” in the Rio Luján and Luchetti neighborhoods. In addition, they provide school support, sports and pediatric controls. Fifi says that this last time many middle class people started sending their children to eat. “We see daily the fall of the middle class,” he says. They calculate that with 100 pesos per day they give food to a boy, for that reason, they seek to obtain the help of many individual donors, who contribute from 200 pesos, through www.donaronline.org/manos-en-accion/donar- help; 0800-888-1374.